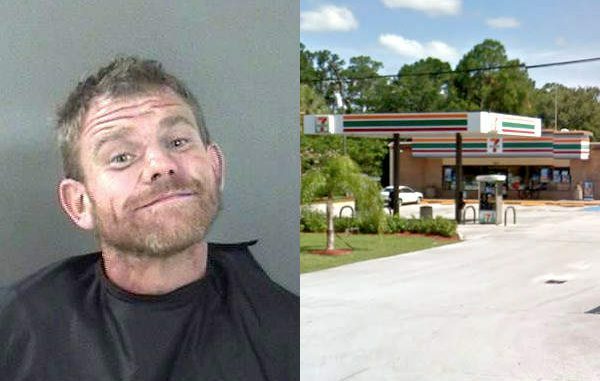 A man tells police in Vero Beach that he's too drunk to fight after starting a disturbance inside the 7-Eleven. VERO BEACH – The 7-Eleven store in Vero Beach, located on 20th Street, called the Indian River County Sheriff’s Office about a man creating a disturbance. As deputies arrived at the Vero Beach 7-Eleven, they saw a man, identified as 37-year-old Philip Marshall Kern, in the convenient store. Kern appeared to be in a fit of anger, as he was flailing his arms around before pushing the front door open so hard that it almost hit other patrons, according to the report. “As I approached the front door of the business, Kern looked directly at me and began to flee on foot to the wooded area behind the business,” a deputy said. Deputies gave chase and yelled to Kern to stop running. As they attempted to take control of him, he pulled away several times. Ultimately, Kern stopped resisting after ignoring commands to place his hands behind his back. “During the apprehension, Kern made the spontaneous utterance ‘I’m not going to fight you, I’m drunk,” the deputy stated. The statement was also supported by the smell of an alcoholic beverage emitting from Kern’s person combined with slurred words, the report said. Deputies then made contact with the 7-Eleven store employee, who advised Kern was agitated and hostile while throwing his head into the partition inside the Vero Beach business. Kern was arrested and transported to the Indian River County Jail where he was charged with disorderly intoxication and resisting arrest. Once at the jail, Kern started to throw his head onto the intake counter and had to be placed in a chair with restraints.